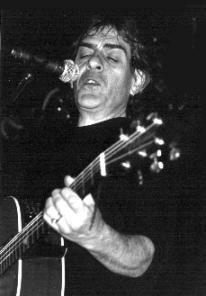 Once upon a time, Gabriel Yacoub headed the most important roots band that possibly ever came out of France - Malicorne. 30 years later Gabriel is still playing and touring with folk music, in his latest project coming back to the roots, joined only by a fiddler and a bassist. I took his recent German tour as a good reason to find out about his new project as well as reflecting the good ol' Malicorne times. Gabriel's latest trio is maybe his best band since Malicorne, featuring only young female fiddler Nathalie Riviere and bassist Yannick Hardouin. This acoustic line-up gives accentuation to Gabriel's impressive and emotional voice, it leaves time and space for the audience to listen to the words of the songs. The fiddle playing is highly inventive, sometimes being used as a kind of second voice in the songs. Stylistically, the music of the new Gabriel Yacoub Trio is somewhere between French and Celtic Folk, French Chanson, Classical music, maybe also a bit of Pop. Still, over all lies the unique and destinctive sound of Gabriel Yacoub that we know since his Malicorne times. At his concert in Wuppertal in the Live Club Barmen (once upon a time also called Folkclub - but that is long ago; these days we can be happy if there are any folk concerts at all), Gabriel's programme had its clear base in his own songwriting, still the audience got to hear also a couple of traditional songs, both of Malicorne times and of his solo carreer; even a traditional French a capella song was part of the programme. I asked Gabriel to tell me how he came to this new acoustic trio. "I have been performing with different kinds of setup in the past for the last few years, and the last line-up, the last band I had was big, more like a real Rock'n'Roll band, basically bass, drums, electric guitars, keyboards. I think I felt a bit tired of this - although it was very good, the musicians were very good, and they are still wonderful musicians and good friends. But I wanted to do something more simple, more direct, I wanted to be able to play in big venues as well as in small ones. So I tried to imagine what would be the best way." He asked Yannick, the bass player and a musical partner for almost 15 years, to join his new trio. "I thought we needed a melodic instrument, and I love the violin - I have been working with violin players for many years. So I thought this would be a good combination. And we are doing this as a trio for almost three years now, and it's the only thing we are doing - no more big band. I am very pleased with that. Because the music we play is very simple, very settle, we can do lots of good things, breathing with the instruments and really enjoy it without having to shout in front of the drum kit." 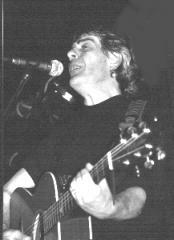 Gabriel's first interest for roots music came from American folk music back in the 60s; the first thing was Bob Dylan. Then he started to get deeper into the music, finding out about Woody Guthrie and the real traditional music from America. He loved this music and it gave him a lot of inspiration. Yet after having learnt some time American folk songs, he felt that he wanted to experiment in a new direction: "I had the feeling that I had to do something with my own culture." His life as a professional musician started along with harpist and singer Alan Stivell, one of the most influential Breton musicians ever. Being only 18 years old at that time, he played for some time in the early 70s in Alan's band. "Rather soon after that, around 1973/74, I formed Malicorne. We had the idea for the band to try to perform old songs in a new way." Now, twenty years after the big times of Malicorne, the influence of the band for French folk music might be reflected. Says Gabriel: "I think Malicorne was a kind of a booster for the French folk revival, because it was one of the few big, more successful bands to appear. And also I think we were good in never doing obvious things, never doing the things or songs like some other bands would do - not on purpose, but just because we loved that, we loved strange interesting vocal harmonies, we loved being open to all sorts of instruments. We were never trying to do it exactly as old people used to do in that century; we were open to lots of things to join with folk music, medieval music and all that." "I think Malicorne gave to younger people a kind of an open window to that kind of music, saying this is not limited to certain kinds of instruments, or certain styles of singing or certain kind of arranging songs. Everything is possible. We have had no limits - the only limits we had were our tastes really. You know if we liked a grand piano, we would use a grand piano, or a drum kit or a saxophone - anything. I think it opened a little bit the eyes - because as in every kind of revival there were purists who would say it should be done this way. Well I respect these people, most of them really have done great work; but we were not like that, no, we were young - the first thing was to have fun and have pleasure. So while trying to be respectful to this repertoire, we also tried to make it a bit more lively." And still today, listening to the old Malicorne recordings, you never would get the feeling that this is out of date music, it sounds in no way like music with the dust of the early seventies, but still today very innovative and exciting. As all things need to have an end, as good as they might be, Malicorne split after a bit less than ten years, a couple of CD recordings and a lot of concerts. Around the beginning of the eighties Gabriel had the feeling that he wanted to write songs. "Without quitting with the folk music in the traditional way, I started to write my own songs. And that is actually what I do now, it is performing my own songs as well as folk songs, because of course I love them. And I learnt a lot from folk songs, it is still my school really, this is how I learnt to sing and play and arrange and record - everything. So now I tried to do something new but really deeply rooted in the folk music traditions." "I think it's very positive. I like the old fans, you know the big guys with beards and all that, but it's nice to see the audience getting a bit younger." Gabriel Yacoub has been an important part of the French scene for about 30 years now. Having always had a close eye and contact with the French folk music scene, can he give a bit of a reflection of the developments of the French scene in the last quarter of the last century? "It has always been very slow. You know, I would say folk music is a general concept; this music has always been kind of marginal, had never big hits on the radio, or on TV, so it's always been a bit off the beaten track. Things go very slowly." "When we started in France there was not much folk music going on; we had to invent everything, we searched through old books to find songs. Now it's very different, there was this big revival in the 70s, and folk became something like an official part of people's culture. Now you can learn all these instruments, in workshops, sessions, courses, masterclasses and all that. There are a lot of things going on, a lot of young people learning how to sing, how to play these old instruments. But most of them don't want to be big stars, they just want to play because they love the music. Most of them are not professional, they just play for their own pleasure. There are a lot of very good musicians all over the country, but only few records coming out, because not many of them are willing to become professional or be stars." "So it's very slow and very - I don't know how to describe that, but it's quite intersting, there a lot of things developing, with a lot of young musicians playing very well. But there is nothing like a real - like for France, Alan Stivell was like a hero, he started the whole thing, but since then there has not been someone like a star or a group who started a new thing. But it's all like boiling, cooking slowly, so it can happen any time that something new is coming out. In the meantime it's very under ground." So there are chances for a new and big folk revival in France, as soon as there is coming a new Alan Stivell, like it has happened recently in Galicia with Carlos Nú�ez, in Belgium with La�s or in Sweden with Garmana. Yet Gabriel Yacoub has done his bit for French folk music during his long carreer, and he still knows how to impress his audiences in his concerts. The new recording of Gabriel Yacoub with his trio will come out in September. The last CD "Babel" from 1997 is reviewed in the German version of this issue.